Origin and Habitat: South America, it is widespread cultivated for living fences and as an ornamental plant and thus difficult to know its natural occurrence; probably native to the western Caribbean and Venezuela (or Brazil). The species is common in gardens in tropical and subtropical countries around the world and has been planted commercially as a fruit crop on a small scale in Netherlands Antilles, other Caribbean, Mexico, Israel and USA and often subspontaneous from abandoned cultivations. In South Africa it is considered a weed. Ecology: In spite of its nocturnal flower opening, day time active honey bees can act as pollinators using the few hours the flowers are open in the late evening or early morning. 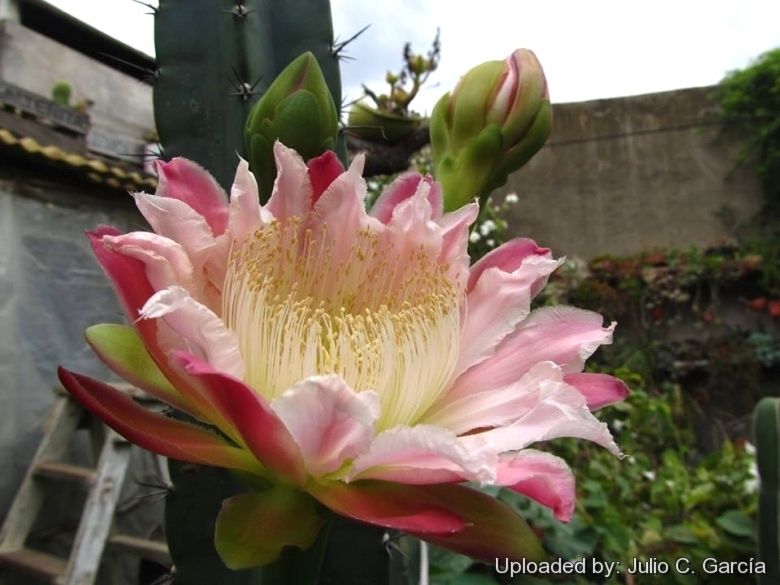 Description: The Peruvian apple cactus (Cereus repandus) more often known under the name of Cereus peruvianus, it is a tall, spreading columnar cactus well known to cactus fanciers throughout the world. It is grown mostly as an ornamental plant, but it has some local culinary importance, and is probably the most widely cultivated Cereus. Stems: Cylindrical, somewhat slender, segmented, grey-green to blue, 10-20 cm in diameter. Ribs: 9-10, fairly low, rounded, somewhat compressed and undated, to 1 cm high. Spines: Extremely variable, often numerous, sometimes absent, grey, needle-like, the longest to 5 cm. Flowers: Nocturnal, each flower opens for just one night and then shrivels up, white with reddish tips, 12-15 cm long. It is self-incompatible and requires cross-pollination to obtain fruits. 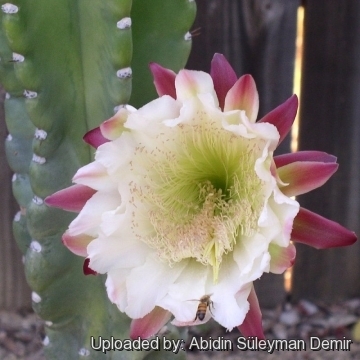 Blooming season: During the warm season Cereus peruvianus produces several flower flushes. Fruits: The fruits, known locally as "Pitaya", “Peruvian Apple” or “ Koubo” are globose to elongate up to 4 cm long, thornless usually red with white pulp, but skin colour vary from yellow to deep violet-red. The edible flesh is white and contains small, edible, crunchy seeds. Fruits tend to crack during ripening and flesh sweetens as the fruit opens out fully. The optimum harvest stage is when the fruits are close to or at full ripeness. Once harvested, the ripe fruits must be eaten within twenty-four hours, or they begin to ferment. 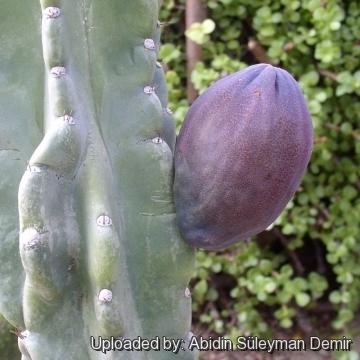 Fruit take about 40-50 days to swell and ripen, so there are often flowers and fruits on the plant at the same time. A single large plant may produces hundred of fruits every year. Remarks: The cells of Cereus Peruvianus contain an immense quantity of crystals of oxalate of lime (a.k.a. raphides) that in some parts of the tissue may form at least an 80% of the whole mass. They appear to the naked eye like very fine glittering sand, and, under the microscope, as rectangular prisms, with tetraedral points and a square or parallelogrammic base. They may be found abundantly in most succulent Monocotyledons, but in no plants had they been seen so abundant or so large as in Cereus peruvianus. Notes: Even more intriguing, the apple cactus is widely touted as having the power to correct physical ailments caused by electromagnetic radiation. How and why this particular virtue was discovered are unclear, but the plant is widely sold potted with the recommendation that it he located near a computer screen or television in order to reestablish an electromagnetic equilibrium upset by the device. Or some such thing. 10) J. Weiss, A. Nerd, and Y. Mizrahi. 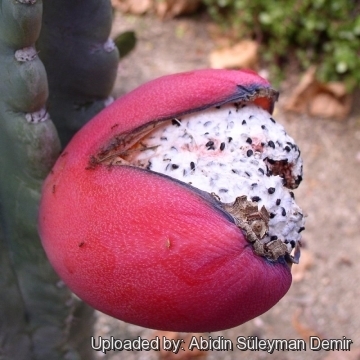 “Development of Cereus peruvianus (Apple Cactus) as a new crop for the Negev desert of Israel” p. 486-471. In: J. Janick and J.E. Simon (eds. ), New crops. Wiley, New York.1993. Cultivation and Propagation: Cereus peeruvianus is very easy to cultivate, easy to propagate, tolerates moderate frost, and produces numerous showy white flowers 15 cm across. Hardiness: Reputedly sensitive to frost , but less so if kept on the dry side prior to, and during, cold weather (hardy to -5° C for short periods). However some warmth throughout the year will increase the grower's success (minimum 5° to 8°C during rest season). In presence of high atmospheric humidity make sure that your saguaros are not exposed to freezing temperatures, or they may die. Outdoors this plant is very adaptable, as long as you avoid excessive humidity in the winter months. Garden uses: Excellent as landscape or patio plant. It is suitable for “desert” gardens, in association with other xerophytes. Where the open air cultivation is not possible due to the climate, it is to be cultivated in pot in order to shelter it in winter. It look fine in a cold greenhouse and frame. Slow growing and delicate cactus species can be grafted on Cereus peruvianus root stocks to provide faster growth. 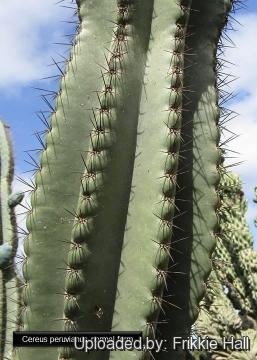 Uther uses: Fruits and stems of Cereus repandus are edible, the cactus is cultivated for use as a living fence, its wood has been used in making furniture and for firewood, and sliced stems have been used as a soap substitute. The goose-egg-size fruits contain a delicately sweet white pulp with delightfully crunchy black seeds. They possess the added virtue that their husks are free of spines. The plant's rapid growth and fruit production apparently have made it attractive throughout the tropics.